After finishing the RBC Canadian Open at two under par in a tie for 61st, Michael Thompson will be taking a week off from the PGA Tour and will be hosting the inaugural Thompson Invitational in his hometown of Tucson, Arizona. Here's a snippet from the Arizona Daily Star describing the event. The entire article can be found by clicking on the title. After he completes his round today in the Canadian Open, Rincon/University grad Michael Thompson will take a week off from the PGA Tour and return to Tucson. Thompson, runner-up at the 2012 U.S. Open, has established the Thompson Invitational, a statewide junior tournament for boys and girls 13-18 that will stage its inaugural event next Saturday and Sunday at Oro Valley Country Club. It is Thompson's way of giving back to the Ricki Rarick junior golf program and the state's JGAA, the formative golf organizations of his junior days. His longtime swing coach, Susie Meyers, a former UA and LPGA golfer, and her husband, Dan, a former Arizona Amateur champion, are the forces behind the event that they hope will become the premier junior tournament in Arizona. More than 50 junior golfers have entered the inaugural Thompson Invitational. So far this year, his second season on the PGA Tour, Thompson has earned $1,215,966 and is ranked No. 57 in the world golf ranking. For the second year in a row, Michael Thompson has made the cut at the RBC Canadian Open. In doing so, Michael ended his short streak of missed cuts after he shot an even par 70 during the second round at the Hamilton Golf and Country Club in Ontario, Canada. He is currently tied for 53rd. In both of the first two rounds, Michael hit 10 out of 14 fairways which has him in a tie for 11th for the tournament in driving accuracy. During the second round Michael's putter regained some of its typical fire power and he ended the second round with +1.916 in strokes gained putting. His second round included four birdies and would have been much better except for the 18th hole where he made a kerfuffle of things and ended up with a triple bogey. Michael tees off on Saturday at 11:13 am ET with Seung-Yul Noh and Canuck Graham DeLaet. The group will begin their third rounds from the tenth tee. 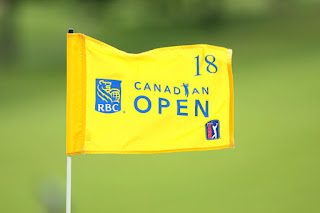 Michael Thompson got off to a hot start in round one of the RBC Canadian Open. Scoring three birdies in a row on holes 3,4 and 5 had him in red numbers early on. He had a great streak of 9 holes in a row with 100% fairways hit and 100% greens in regulation. Although I'm sorry to say that the streak came to an end, he was able to score one more birdie before he was done, offset by two bogeys to finish at -2 and T-24th. All in all it was nice round, and I hope he enjoyed a pop when he was done. Michael tees off on friday at 7:40 am ET with Spencer Levin and Nick O'hern. Michael Thompson returns to North America this week to play in the Canadian Open. This year's Canadian Open is taking place at the Hamilton Golf and Country Club in Ancaster, Ontario located aboot 50 miles west of Toronto. The tournament rotates through Canada, so although he played in this tournament last year, he's on an all new course. If Michael plays well, he may be rewarded with entrance into next week's Bridgestone Invitational. The top 50 on the OWGR list are invited and he currently sits at 57th. Michael tees off at 12:40 ET with Nick O'Hern and Spencer Levin. It will be televised 3-6pm ET on the Golf Channel. Michael Thompson missed the cut at the Open Championship at Royal Lytham and St. Anne's after posting rounds of 74 and 73 on the par 70 links course but just making it into the field defied the odds. Before the week began, Michael sat as the second alternate behind Ben Crane but the field was oversubscribed due to some of the odd qualification rules. Before the tournament began 159 spots had been handed out. The field is intended to be 156 players and alternates would not get in until the number of players dropped below the magical 156 player limit. Last week both Jason Day and Web Simpson withdrew which left the field at 157 players. Undeterred by the long odds of getting into the field, Michael decided to head to England after the John Deere Classic on a charter for PGA players. I decided [to come to England] the moment I found out I was right behind Ben. It was kind of weird this year in that the field was basically overbooked. I just basically said that it's an opportunity to come over here and practice, prepare, just like any other tournament. And for a British Open, that's experience that I need for the future. If I didn't get in we'd go sight‑seeing, because it's fun as an American to be over here. Robert Karlsson's withdrawal kind of surprised me. I wasn't really expecting anybody besides maybe Russ, but I knew he wouldn't make a decision until early morning Thursday. So on Thursday morning, the first day of the tournament, Michael headed over to the golf course in hopes of getting some good news. He still needed one player to withdraw. We heard through other caddies that Russ' back was hurting him, and so it was just kind of an outside chance [that he'd withdraw] and so I got here anyways at 5:30 in the morning. I've been waiting around for a while and found out at 9:00 a.m. that I got in. So that gave me a little bit of time to prepare mentally for the day. But, you know, it was a great opportunity, a great chance. I'm glad I came over. This is a great opportunity with my first British Open and hopefully the first of many. I played 18 [practice holes] on Tuesday and nine on Wednesday, so I was prepared, just as getting ready to play any Tour event. The only downside was having to get here at 5:30 in the morning. But, you know, that's what I had to do and I did it and everything worked out. So, you know, it was just good luck, God's will, whatever you want to call it, that it all worked out in my favor. Unfortunately for Michael, limited practice time translated into a missed cut as Michael had some difficulty adjusting to the links greens. It's very different for us Americans coming over here and playing just with the speed of the greens because we're used to 12 on the Stimpmeter, and these are 8 or 9, and so it's definitely an adjustment. It reminds me a lot of playing on the Hooters Tour, the speed of the greens. These are a little smoother than playing on the mini‑tours. But it's just all about getting a good mindset, having a good feeling, seeing the ball go in the hole before you hit it. And the better you're able to do that, the better you're able to visualize that happening, the easier it is to make putts. And these greens are a little different, a little interesting in that there's a lot of little mounds. And so you're putting over a lot of little mounds, which makes reading the greens a little difficult. I couldn't make any putts. I gave myself some good looks. And a few wayward tee shots on this golf course and you're in deep trouble, literally. And I guess that's the way Open golf is, and you've got to keep it in the short stuff. It doesn't matter if it's the fairway or there's intermediate rough. As long as you have a swing at the ball you can score well. So after a great experience with his first British Open, Michael will be catching the charter back next week to the Canadian Open where he will tee it up all over again. 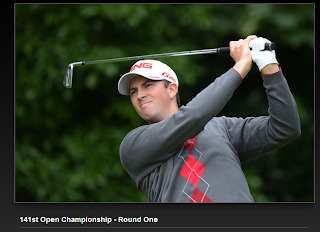 After a week of waiting Michael Thompson has officially gotten into the Open Championship. He will be replacing Russ Cochran and teeing off at 11:53am BT. He will be paired with Steven Alker and Lee Slattery. 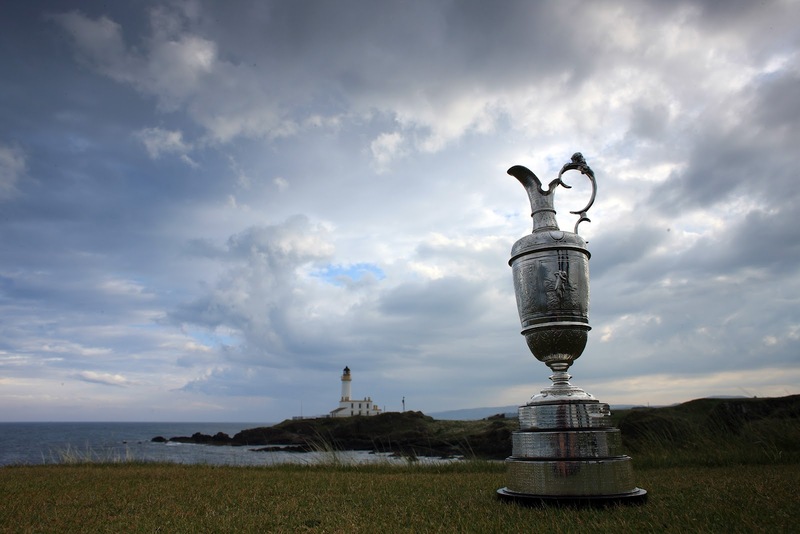 As I write this the first players have teed off at the British Open. It's been a wild and crazy day when it comes to the alternate list, as Robert Karlsson withdrew. As the 157th player entered into The Open, no replacement was added to the field which has a 156 player maximum. One more Withdrawal from the tournament and 1st alternate Ben Crane would earn a spot. Except for the fact that Ben Crane was still at his home in Oregon. After much confusion, it was determined that Ben Crane should be removed (it's not clear whether it was voluntary or not) from the alternate list, thus promoting Michael Thompson to the position of first alternate. Of course if no one else withdraws, Michael won't get a chance to play. So at this hour Michael is at the tournament..... waiting. if Player #156 withdraws - 1st alternate Ben Crane Michael Thompson is entered. We're going to be hopeful here at the Thompson Tide. In fact Roz says he added Michael to his fantasy golf team, part of his quest to have Michael on his team for every tournament he plays in. We'll soon see if Roz is hopeful or crazy, or both. You never know who might drop out at the last second. Here's a snippet from the AP (via HuffingtonPost.com) in which Michael was interviewed earlier today. It provides a pretty good status on the Open Championship alternate situation although the part about Michael being at the John Deere Classic is a little misleading. Michael was there on Sunday to catch the charter but he didn't play in the tournament. ALTERNATE DECISIONS: Ben Crane and Michael Thompson are the top two alternates for the British Open. Both were at the John Deere Classic on Sunday, but that's where the similarities end. Crane, the first alternate, was headed to his summer home in Oregon. Thompson, the second alternate, got on the charter flight for PGA Tour players and headed the other direction for England. "I saw him in the airport," Thompson said Monday on the practice range. "He was surprised I was coming." Crane has not given up on playing the British Open. He has booked flights the next two days. And while it seems like he's taking a big risk by staying in America, that's not necessarily the case. Because of a peculiar set of circumstances, the British Open already has more players than its 156-man field. Even if someone withdraws, the alternate list will not be activiated. Crane would need two players to WD before he gets in. Thompson needs three players to bail out. The third alternate is Matteo Manassero, who flew home to Italy. For Thompson, it wasn't as big of a deal to make the long flight with little hope of getting in. He doesn't have a history of back pain, for one thing. And he has never played the British Open. This is different from the U.S. Open, which doesn't allow alternates to play the golf course until they officially are in the tournament. At the British Open, Thompson can play the course as often as he likes. "That's a big reason why I came," he said. "I could prepare like everyone else. I had friends who were alternates at the U.S. Open, and they couldn't play at all." This is not the first time playing links golf for Thompson, a runner-up at the U.S. Open. He played in the Palmer Cup while at Alabama – matches between college players from the U.S. and Europe – and stayed a little longer to play Turnberry and Dundonald on the Ayrshire coast of Scotland. "I have a good feeling about getting in," Thompson said. "But I don't have any control over that. I'll be ready to go on Thursday. If I don't get in, my wife and I are going to tour the countryside." Player 156 drops out, Ben Crane is added. Player 155 drops out, Michael Thompson is added. I have not heard of anyone being on injury watch, so we'll just have to wait and see what happens. My hopes were up this morning as I read on the perennial golf news powerhouse "Rockford Register Star" that Michael Thompson was the second alternate in the British Open. The article (which you can read here) went on to explain that with Webb Simpson and Jason Day likely missing out on the tournament due to pregnant wives, that Michael Thompson should make it into the field. Turns out, it's not that simple. But before we get into the nuts and bolts, we can say that one thing we do know for sure is that Michael is the #2 alternate behind Ben Crane (confirmed in a tweet from Michael earlier today). What I didn't know this morning is that the British Open has a strange habit of overbooking it's tournament which is suppose to have a minimum of 156 players. Player 156 drops out, Ben Crane added to field. Player 155 drops out Michael Thompson added to field. Webb Simpson has already stated that he wouldn't play so we can pencil him in as "Player 158" in the list above. Jason Day's wife is due tomorrow, and may skip the tournament, but that's still up in the air. Let's go ahead and pencil him in as Player 157 for now. That means there needs to be two additional players that drop out due to injury or other reason for Michael to get in. That's all assuming that you trust wikipedia's numbers which I trust only slightly more than the Rockford Register Star. Are we all good now? Clear as mud. UPDATE #1: Jason Day has officially withdrawn. Webb Simpson has not officially WD'd yet. UPDATE #2: Webb Simpson has officially withdrawn. With both Webb Simpson and Jason Day's wives pregnant and ready to give birth, both of them may have to drop out and miss the tournament, allowing Michael to play. Dowd Simpson is due in late July, and Webb has already said that he would be skipping the tournament. Ellie Day is due July 11, and Jason has said that he would skip the tournament if the baby hadn't come yet. Even if Jason Day is able to attend, there are 155 other players who could withdraw due to an injury or other reason. On twitter, Michael was asked whether he had gotten in the Open, and he confirmed that he was indeed heading across the pond. “@wesleyhelton: @MSlickThompson Did you get in the Open?” I'm second alternate. Heading over there on Sunday. If he's able to make it into the confirmed field, it would mark Michael's first time playing in the British Open, and his fourth appearance in a major. Update: Turns out it's even more complicated. I need to get a supercomputer to calculate out the Open Championship field algorithms to work out the details, then I'll post a more elaborate update. Basically, there's no guarantees and Michael's chances may be even more slim.